I was in search of a good protester or two - which, after the first two days of the Republican National Convention, became rather hard to find in downtown Tampa. So I went to Cafe Hey, a coffee shop in the shadow of Interstate 275 that had become a de-facto hangout for the radical set. 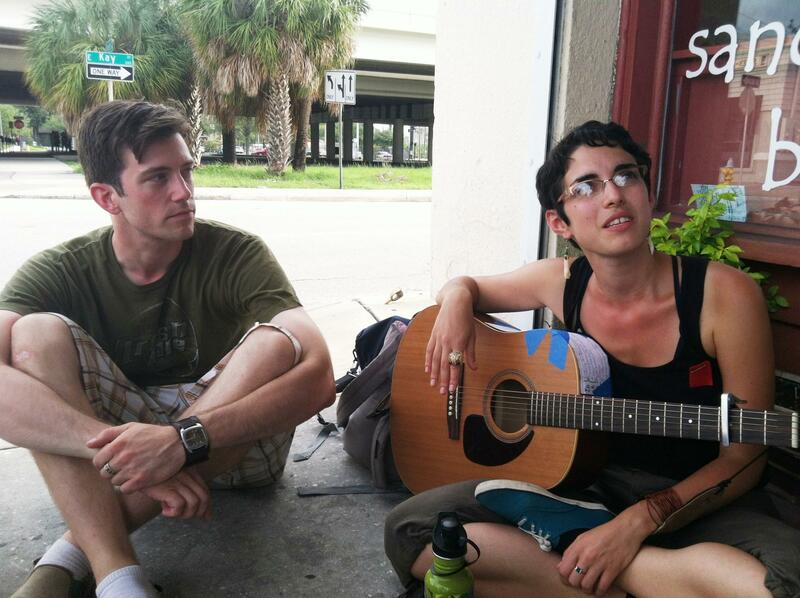 There, I came across Heather Merlis and Justin West, who was strumming a guitar on the sidewalk outside the cafe. It just so happens they are in town to stage "Mr. Satan Goes to Wall Street." Kind of catches the ear, doesn't it? "We oppose violence and boredom. We conduct guerrilla theater workshops for disadvantaged youth and other interested parties wherever we go. We wield theater as a powerful tool for social change." The New York couple talk about their impressions of Tampa and life as a protester, including the so-called Public Viewing Area, which they call the "Free Speech Cage." They'll perform today at 1 p.m. at the Marshall Center on the University of South Florida's Tampa campus. After that, they're off to the Democratic National Convention in Charlotte. They were dressed in masks. Some wore black bandannas over their faces. They were shirtless, beating drums, and one guy wore a boot on his head. "Wake up, wake up! We want freedom, freedom!" They shouted. 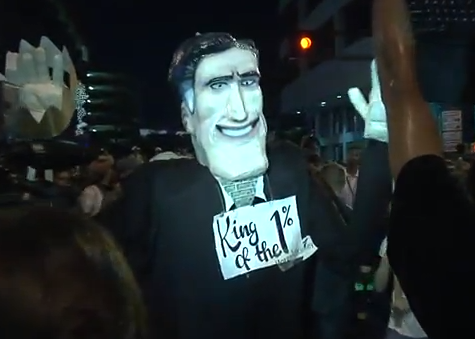 More than 100 protesters marched to Gaslight Park joined by Mitt Romney's effigy. Dozens of officers watched from the sidelines-- some on bikes and others on horseback.